Introducing the U-Boat Classico 45 Titanium Skeleton (Model 8060), a special edition watch limited to 299 pieces worldwide. 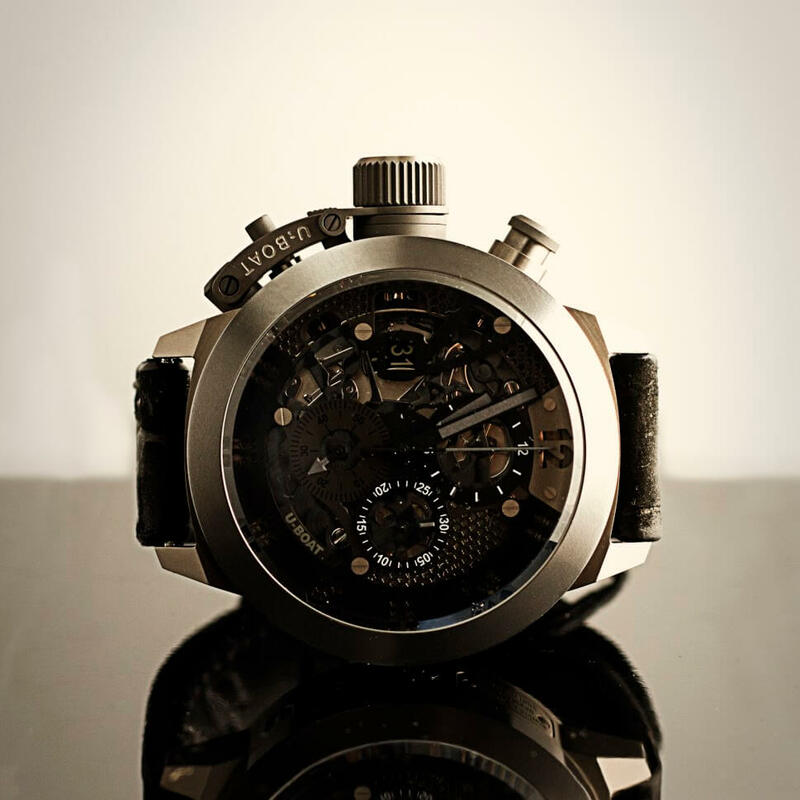 From first glance, U-Boat’s titanium and tungsten special edition skeleton commands your attention. This skeletonized chronograph watch exudes a dark, edgy vibe, featuring a brushed titanium case, tungsten bezel, and matte black alligator band. 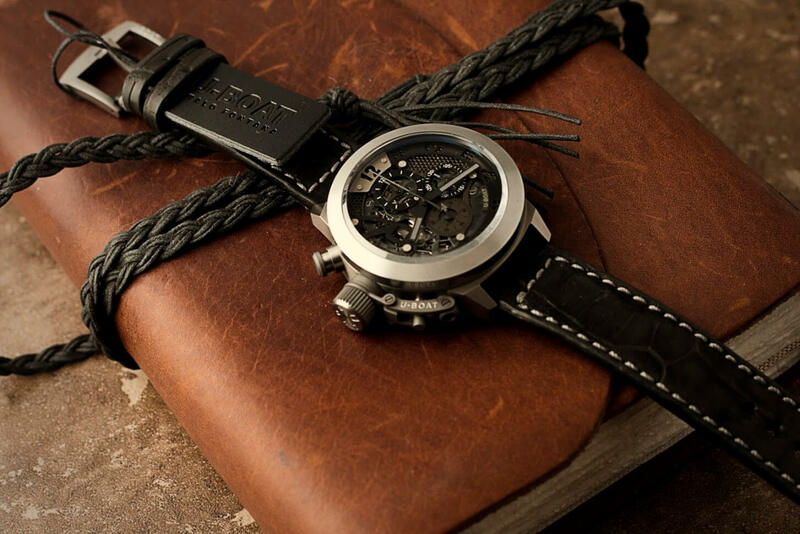 The industrial look and use of unusual metals and manufacturing techniques are U-Boat’s hallmark, and this watch showcases the brand’s design and manufacturing capabilities perfectly. 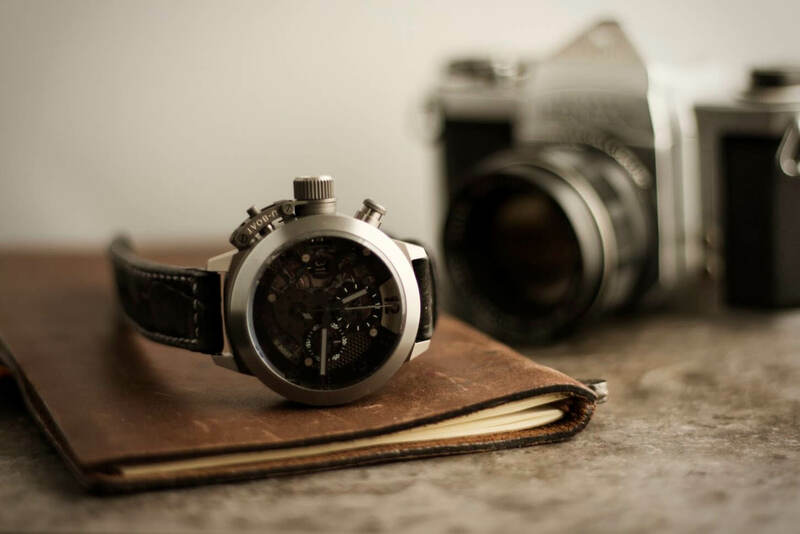 For the U-Boat collector or someone looking to purchase a versatile timepiece that can easily be worn everyday in both a dress and casual setting, this watch merits consideration. While U-Boat as a brand is well-known for its industrial feel, the Classico 45 Titanium Skeleton takes this as step further, embracing an almost steampunk aesthetic underscored by the “skeletonized” features. A skeleton watch allows the wearer to view the gears and jewels of the mechanical movement in action. Here, everything is visible from the front and the back, through both the black dial and the “U”-shaped window on the rear of the case. The movement itself is a 25 jewel, Swiss-made Dubois de Praz mechanical automatic powered by wrist motion, though U-Boat watches can also be hand-wound. The chronograph complications include 12 hour, 30 minute, and 60 second registers, and the watch is water resistant to 100m/330ft/10atm. (Though it’s not marketed as a dive watch, this is more than sufficient water protection for most people.) Finally, the watch features U-boat’s signature left-side crown, including the “cantine-style” cap that the wearer unscrews to access the threaded sport-style crown and set the time. The chronograph start and reset buttons, as well as the date window, are also on the left side. The date is adjusted not by winding the crown, but rather by pressing a separate button also located underneath the crown-protection cap. But enough with the specs – how does it wear? Comfortably, and this watch is more than capable of serving as your primary “daily driver” timepiece. The titanium/tungsten case and sapphire crystal render it essentially indestructible, and while the 45mm case size makes this a large watch, it wears smaller and lighter due to these unique lightweight materials being used for the case and bezel. Make no mistake, this watch will be noticed: the Classico 45 Titanium Skeleton has a bold personality and makes its statement, yet does so without appearing overly flashy or trendy. A key element of the look of this watch is the gorgeous black alligator strap, which has a matte finish instead of the shiny, highly polished leather popular elsewhere. Paired with a brushed metal buckle, the strap fits very well with the luxurious-yet-rough-around-the-edges look U-boat is going for here. There is no compromise on wearability; this is one of the more comfortable watch straps we’ve worn. If for whatever reason the wearer would want to swap out the strap, the lug width is 20mm, so it shouldn’t be difficult to find one that fits, including one of the many other leather straps offered by U-Boat. Someone interested in the patented U-Boat look, but who is looking for something more unique than one of the standard steel or bronze entries in the Classico series. The Classico 45 Titanium Skeleton reflects the bold, adventurous U-Boat design, while still maintaining a classic and versatile look that will age well and serve as a foundation piece of your watch collection for years to come. The price point is also quite attractive for a limited edition watch, especially a skeleton. The Classico 45 Titanium Skeleton comes with a two-year Factory Limited warranty, and ships in a unique presentation box. Only 299 of these watches have been produced worldwide. U-Boat watches are designed by Italo Fontana, inspired by watches his grandfather developed for Italian Navy pilots. The original concept emphasized maximum reliability and readability in all weather conditions: traits valued by naval aviators and which continue in U-Boat’s bold and distinctive design today. All U-Boat watches are assembled in Italy, at the company’s headquarters located in Lucca, Tuscany, and feature Swiss movements. 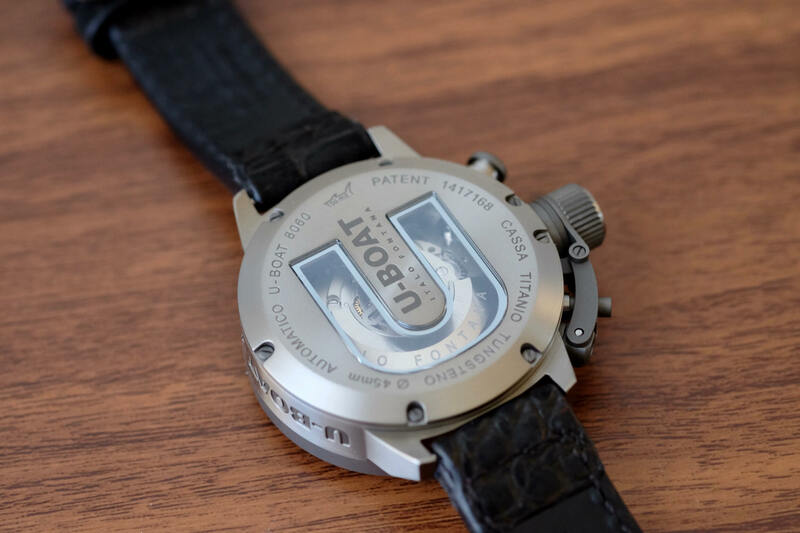 U-Boat’s unique manufacturing techniques give the brand it’s signature industrial look, incorporating uncommon materials such as carbon fibre, titanium, tungsten, carbon, bronze, and ceramic, as well as unusual finishing techniques such as acid washing. On all U-Boat watches, the crown sits on the left side of the watch, instead of the usual right, and is protected by U-Boat’s trademarked “cantine-style” protection system. Those interested in reading further on the brand’s history and philosophy should visit the company’s website. Next Next post: After 60 Years, the Retro Duo Cart Returns!